Stainless steel sinks have graced more kitchen designs than we can possibly count. Like white kitchen designs, the stainless sink is a classic look that complements any style and is a durable and practical option. What about an alternative to stainless if you just want something different for your kitchen remodel? Kitchen design has come a long way and developments in the variety, styles, and durability of kitchen sink options has followed. Below, we’ll discuss the three most common sink styles, as well as several alternative materials to stainless steel and the pros and cons of each. Undermount sinks are installed under the countertop, offering a fresh, trendy look. With no exposed edges, you can wipe crumbs directly into the sink, making cleanups a breeze! A top-mount sink is dropped in from above and its rimmed edge overlays the counter. With the rim of the sink on top of the counter, these sinks can be a little harder to clean as dirt and gunk can get easily caught. 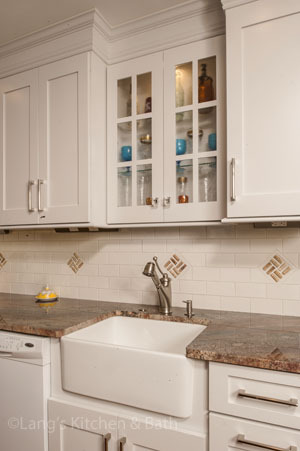 Top-mount sinks are most commonly used with Formica countertops. 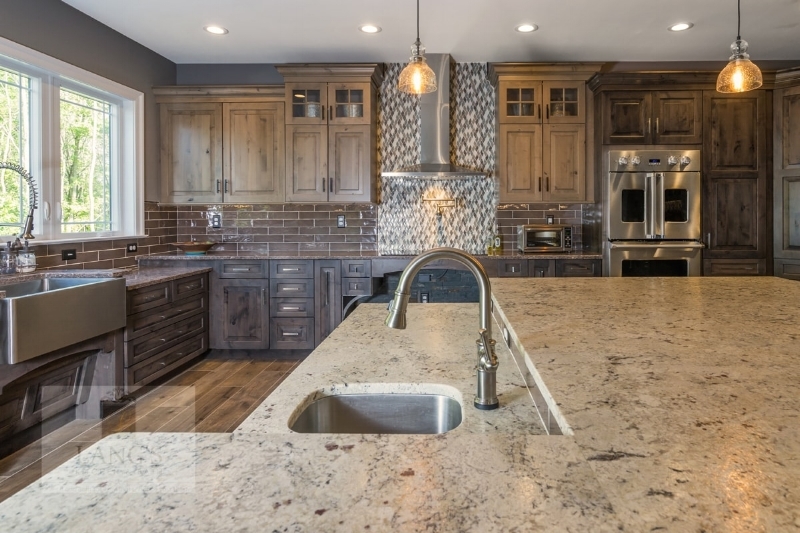 Farmhouse sinks are a large, single basin that feature an exposed front, and they easily complement kitchen design styles that go far beyond rustic, farmhouse kitchens. Their vintage look and the fact that they come in a wealth of colors have made farmhouse sinks increasingly popular over the years. You’ve probably seen an enameled cast iron kitchen sink in your grandmother’s house. Coated in a porcelain enamel and fired at high temperatures, this sink is hard and durable. If you’re looking for a bright, glossy look this is a good choice for your kitchen remodel. These sinks come in a variety of colors and will fit into most budgets. Is a solid investment, as it can easily last a life time. Not compatible with abrasive cleaners. Composite sinks are available in both granite and quartz composite. This manufactured sink is composed of resin mixed with either granite or quartz, making it incredibly durable. They offer the look of natural stone in a variety of shapes, sizes, and more importantly, colors. Heat resistant, particularly the granite composite. Requires more daily maintenance than other sinks. Fireclay sinks are crafted from a ceramic material that is fired in a kiln at temperatures above 1800°F, which makes them incredibly durable. These sinks have tons of character and are perfect for those looking to install a farmhouse sink in their kitchen design. White and off-white are the most common colors, but can be found in blue, black, and grey. Non-porous finish that's easy to maintain. Requires careful installation of drain and garbage disposal to avoid cracking. Copper sinks are incredibly durable, but more interestingly, they will be the visual centerpiece of your new kitchen. Copper is a living surface that will develop a patina (a green or brown film produced by oxidation that develops on the surface of certain metals), which will allow the colors to evolve throughout the years. Your new copper kitchen sink will add supreme character and charm to the newly renovated space. Naturally resistant to microbial growth, making it an ideal antibacterial surface in the kitchen. In the end, choosing the right materials for your kitchen remodel means balancing several factors. Look for selections that suit your design aesthetic, family’s needs, and overall budget. Remember, there isn’t a one-size-fits-all approach to kitchen design! For examples of kitchen design plans, visit our kitchen remodeling gallery. If you’re ready to start a kitchen renovation, contact Lang’s Kitchen & Bath at 215-968-5300 or visit our Newtown showroom today!